Gigabit speeds, eco-minded operation, performance-minded features and a lifetime warranty make Buffalo's BS-GU Series of Gigabit Green Ethernet Switches a perfect network extension solution for your office. Buffalo's Gigabit Green Ethernet Switches come with a compact and durable all metal chassis and are fanless which provides silent and reliable operation. Buffalo's lifetime warranty* ensures that you will never have to replace your switch due to defects. Multiple gigabit Ethernet ports provide fast transfer rates of large bandwidth intensive files including graphics and multimedia.. Featuring 5 gigabit ports including 4, ports and a maximum 50W PoE budget, the BS-GU2005P provides sufficient power for standard networked devices. Simply plug your network ready devices into one of the available Ethernet ports. Each AUTO-MDIX port automatically detects and configures the correct connection while optional jumbo frame support and full duplex operation provide maximum performance, up to 10 Gbps of total bandwidth. Buffalo's BS-GU2005P Gigabit Green Ethernet High Power PoE Switch offers network design flexibility without the reliance of AC power through its high power PoE feature. Many devices including routers, surveillance cameras andhome automation equipment can be powered through PoE which allows you to place these devices anywhere in your home or office, regardless of whether there is an AC outlet available. In addition, the fact that PoE eliminates additional AC power cables reduces clutter and gives your home or office a cleaner appearance. 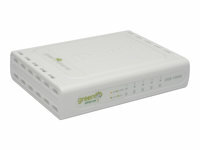 Buffalo's BS-GU2005P Gigabit Green Ethernet PoE Switches come with loop prevention which shuts down the port(s) where a network loop is detected. 802.3x flow control on each port minimises dropped packets when the port’s receiving buffer is full. This gives you a more reliable connection for all of your connected devices. Adjust power usage Smartly adjusts power consumption by detecting the link status and the length of connected Ethernet cables. When the ES-105A v3 detects no active data transmission, the device automatically enters the power-saving mode to avoid energy waste. When a port reaches its receiving buffer capacity, the 802.3x flow control feature activates to minimise dropped packets. By minimising the number of dropped packets, the switch provides a more reliable connection for all of your connected devices while surfing the web, playing games, or accessing media. 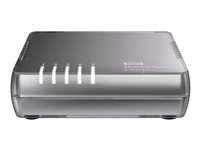 The NETGEAR 5-Port Gigabit Ethernet Switch - Essentials Edition with plug-and-play and compact design provides an easy, reliable and affordable Gigabit Ethernet connection for your home network. Features include auto-MDI/MDIX, eliminating the need for crossover cables and LED indicators for ease of use. Energy-efficient technology provides power savings. 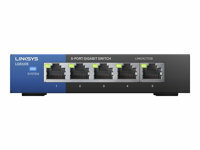 Accelerate the performance of your local wired network with the Linksys LGS105 5-Port Business Desktop Gigabit Switch. Offering five gigabit Ethernet auto-sensing ports with wired connection speeds of up to 1,000 Mbps, this unmanaged switch lets your small business expand its local network and send large files to servers, drives, and printers at gigabit speed. With plug-and-play convenience and auto-sensing ports that automatically optimise speed for each connected device, the Linksys LGS105 Gigabit Switch offers a quick and easy solution for extending your office network. Gigabit performance These unmanaged switches offer Gigabit speeds to minimise transfer times and greatly enhance the ability to stream high-bandwidth files to connected devices without interference. Plug-and-Play convenience Linksys unmanaged switches offer a quick and easy solution to extend your office network with plug-and-play installation. Quality of Service (QoS) traffic prioritisation QoS traffic prioritisation gives precedence to particular devices or activities to ensure mission-critical data throughput is maintained regardless of network congestion. Auto-sensing ports automatically optimise speed for each connected device. Power saving features Power saving features include auto power-down to disable unused ports, smart power for short cable runs, and a port status switch to control LED lights. The NETGEAR® 5-port Gigabit Unmanaged Switch provides an easy, reliable, and affordable way to expand your network connections in homes and small offices. It is plug-and-play and features a rugged metal case. Features also include Auto-MDI/MDIX, LED indicator on each port, energy-efficient technology, fanless design, auto-negotiation and non-blocking switching architecture. The DGS-105 5-Port Gigabit Unmanaged Desktop Switch offers an economical way for SOHO and small and medium businesses to benefit from the increased bandwidth of Gigabit Ethernet. It provides five Gigabit ports for easy expansion of your network and a quick way to upgrade your network to Gigabit connectivity. The DGS-105 5-Port Gigabit Unmanaged Desktop Switch are ideally suited for Small Office Home Office (SOHO), Small Medium Business (SMB), and Small Medium Enterprise (SME) environments. 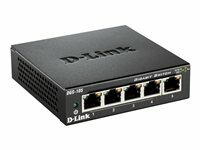 With a durable design, silent operation, and plug-and-play functionality, the DGS-105 switch can be easily set up and be placed in almost any location where network connectivity is required. Support for IEEE 802.3az Energy-Efficient Ethernet (EEE), Layer 2 Quality of Service (QoS), and Gigabit Ethernet connection speeds provide advanced features in a compact package. The DGS-105 are designed with durability and performance in mind. Their sturdy metal housing ensures the product can withstand extreme temperatures and can be placed in typical industrial environments such as factories, construction and mining. They help to dissipate heat and reduce stress on internal components. The DGS-105 is designed with durability and performance in mind. Its sturdy metal housing ensures the product can withstand wider operating by helping to dissipate heat and reduce stress on internal components. All of the ports on the DGS-105 switch support automatic MDI/MDIX crossover, eliminating the need for crossover cables or uplink ports. Each port can be plugged in directly to a server, hub, router, or switch using regular straight-through twisted-pair Ethernet cables. In addition, the DGS-105 switch feature multiple front-facing, easy-to-access Ethernet ports with two colour LED indicators per port to easily distinguish link status. The DGS-105 switch feature green technology, such as IEEE 802.3az Energy-Efficient Ethernet (EEE), link status detection, and cable length detection. Energy-Efficient Ethernet reduces power consumption of the switch when network utilisation is low, reducing the cost of ownership during periods of inactivity. Link status detection automatically powers down ports when there is no link detected, saving power when the connected device has been shut down or disconnected. Cable length detection automatically adjusts the power output of the port based on the length of the cable, reducing the power requirements of the switch to only what is necessary for the installation. The DGS-105 switch include traffic management features, such as IEEE 802.1p Quality of Service (QoS) and IEEE 802.3x Flow Control. The 802.1p QoS feature allows traffic to be classified in 8 priority levels, allowing different types of traffic to be prioritised, depending on their importance. Flow Control signals to clients when the switch’s input buffer is full, helping to minimise dropped packets and providing a more reliable connection for all of your connected devices. Build a fast, reliable network with these entry-level, low-cost, reliable networking solutions that provide plug-and-play connectivity. The SF110D-05 Unmanaged Desktop Switches deliver Fast Ethernet switching with key features like energy efficiency, traffic prioritisation, and network diagnostics for seamless integration into the rest of the network. The SF110D-05 Cisco Small Business 110 Series Unmanaged Switches delivers a wire-speed Fast Ethernet connectivity to connect your small business office. 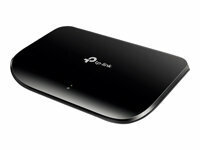 The 5 Port desktop model offers plug-and-play basic Layer 2 connectivity. That includes quality of service (QoS), cable diagnostics, and loop detection - all in a switch that you can set up by yourself in just minutes. NETGEARs FS105 ProSafe Unmanaged 5 port Fast Ethernet Desktop Switch is known for its reliability and performance, providing your LAN with high-speed, 10/100 Mbps auto-sensing connectivity for up to 5 users. Just plug in your Ethernet cables, connect a power cord, and you’re ready to go-there’s no software to configure. They negotiate to the fastest possible connection and with Auto Uplink™ technology, these switches automatically figure out if the link needs a straight through or cross-over connection, and makes the right choice. Existing 10BASE-T devices are easily integrated within higher bandwidth environments, with full wire speeds on all ports of either 10 Mbps or 100 Mbps. Engineered without the need for internal fans, they operate silently. And each of these very compact switches is housed in a sturdy metal case for years of dependable use. Once you connect the hardware, your switch is operating! Auto negotiation takes care of the speed and duplex, while Auto Uplink eliminates the need for toggle switches or special crossover cables. When you want solid network performance for your growing business, plus the added benefit of quiet operation, NETGEAR’s ProSafe FS105 is your best choices for quality, convenience, and smooth — running usability — at a very affordable price. 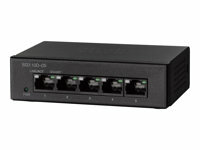 The HPE OfficeConnect 1405-5G v3 JH407A Switch is a 5 port Gigabit Plug-and-Play unmanaged switch designed for small offices. The 1405 Small Office switches are preconfigured for fast, easy installation, with connections using low-cost Ethernet copper cabling. They support administration-friendly features such as auto-negotiation and automatic cable type detection (MDI/MDIX). The models have energy-saving features such as Energy Efficient Ethernet (EEE) and idle-port power down. All models are fanless for quiet and "green" operation, and are designed for high reliability, long life, low power consumption, and low total cost of ownership. Prioritises traffic by honouring Differentiated Services Code Point (DSCP). Automatically adjusts for straight-through or crossover cables on all 10/100/1000 ports. 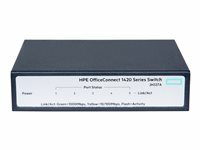 The HPE OfficeConnect 1420 5G JH327A is a 5 Port Gigabit Unmanaged Switch that delivers cost effective gigabit Ethernet (1GbE) connectivity offering small businesses 10 times the performance of Fast Ethernet with unmanaged plug-and-play simplicity. Featuring a silent fanless operation, automated features for hands off operation and low power consumption. They come with limited lifetime warranty and 24X7 phone support for 90 days. HPE OfficeConnect 1420 switches have quality of service (QoS) support and IEEE 802.3x flow control features that improve network efficiency. Simplified plug-and-play convenience is supported by features such as auto-MDIX and auto-speed negotiation. Hewlett Packard Enterprise has innovated and combined the latest advances in silicon technology to bring you some of the most power-efficient switches. 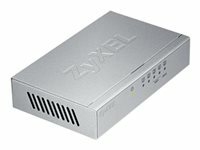 All models support the Energy Efficient Ethernet IEEE 802.3az standard, as well as auto power-down mode on idle ports and power saving on short-distance cables.. Cost-effective, High-performance GbE Layer 2 Switching The HPE OfficeConnect 1420 5G Switch features gigabit Ethernet (1GbE) connectivity offering small businesses 10 times the performance of Fast Ethernet with unmanaged plug-and-play simplicity. Automated Features for Hands-off Operation The HPE OfficeConnect 1420 5G Switch is plug-and-play with zero configuration and no required ongoing administration. IEEE 802.1p prioritisation and other QoS features automate the preferred handling of high priority traffic, including Differentiated Services Code Point (DSCP) set priorities. The OfficeConnect 1420 5G Switch supports jumbo packets to improve the performance of large data transfers. Cost-effective Ownership for Now and into the Future Green features include energy-efficient Ethernet IEEE 802.3az, auto-power down mode on idle ports, and power savings on short distance cables for low power consumption. Build a fast, reliable network with these entry-level, low-cost, reliable networking solutions that provide plug-and-play connectivity. The Cisco SG110D-05 Unmanaged Desktop Switches deliver Gigabit switching with key features like energy efficiency, traffic prioritisation, and network diagnostics for seamless integration into the rest of the network. The SG110D-05 Cisco Small Business 110 Series Unmanaged Switches delivers a wire-speed Gigabit connectivity to connect your small business office. The 5 Port desktop model offers plug-and-play basic Layer 2 connectivity. That includes quality of service (QoS), cable diagnostics, and loop detection - all in a switch that you can set up by yourself in just minutes.